Airscan is the award winning Wireless Journey Time Monitoring Solution created by Iknaia. We use a new generation of sensors that analyse anonymised data from Bluetooth and WiFi devices in passing vehicles to provide real-time journey time data. Trialled and proven whilst deployed on the M3 Smart Motorway project in Conjunction with Colas, Balfour Beatty and Highways England. Our platform calculates the time it takes to drive through diversion routes and provides real-time accurate information to motorists on road side Variable Message Signs (VMS), while informing works supervisors of any traffic congestion, such as that caused by collisions. 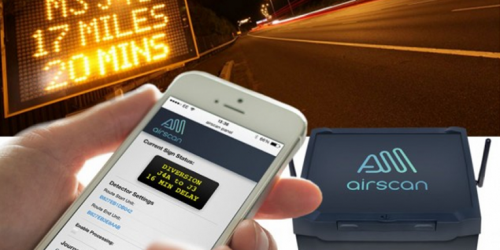 Airscan has revolutionised the approach to the provision and management of diversion routes. Airscan’s additional Air Quality Monitoring module uses high performance, reliable, small and low-power gas sensors to record real-time air pollution data. This low cost system is easy to set up and install, extremely mobile and can cover more space quickly and more cost effectively, than the traditional monitoring stations.